Home Dentistry Papers of FCPS Part 1 Errata of different MCQs Books! Errata of different MCQs Books! 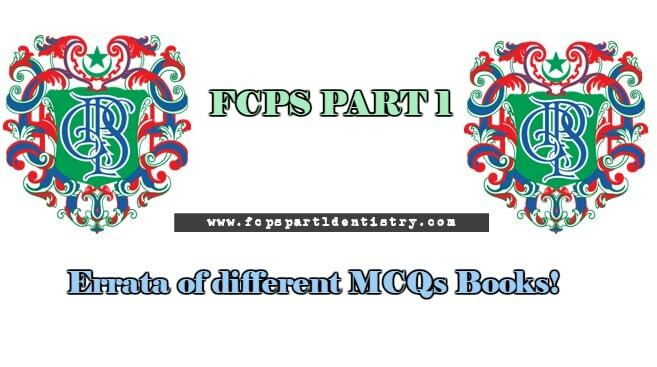 For the preparation of FCPS Part 1, there are too many MCQs Books available in the market by different names. All these Books are made on the Basis of MCQs shared by the candidates who appear in the exam of FCPS Part 1. So it is a long process of collecting all those MCQs and after compilling them Keys are made with hard work. So it is a difficult task indeed. All MCQs are collected through different groups in Face Book, in which there are many students who prepare their test there. After the Prep when they take the exam, they share all those MCQs remembered by them. 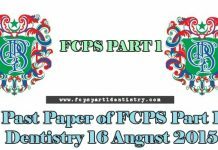 As it is the process of knowledge and memory of all those candidates, so it is not compulsory that all shared MCQs should be the same as that in the real exam of FCPS Part 1. There may be some changes in the statements or options. As remembering the same 200 questions is too much difficult. So keep in mind that whenever you enter the exam center, do not get confused if the statement is a bit different or options are not the same. Making of these Books of MCQs can have errors in it. Sometimes few questions can be wrong, sometimes few options can be wrong and some times few keys. So any Human Error can be there which you people can face. Errata are the corrections of different MCQs Books of FCPS Part 1. As there are many mistakes while making MCQs Book. So whenever you people read or learn MCQs from a specific Book, try not to follow blindly the keys of all Books. Try to solve each and every MCQs by yourself. Whenever you feel any sort of doubt, try to solve it through the text Book of that specific subjects. So in short you have to be careful when you solve the MCQs. Many students try to solve all those mistakes and make a file which is known by the name of Errata. Below are the Errata of Different MCQs Books. When you will read all these MCQs Books, kindly check this Erratas as it will solve all mistakes. Hopefully it will help you guys. Once again i will want to mention that do not trust blindly on the Keys of MCQs Books, always try to solve each and every MCQ by yourself as it will make your preparation more precise and meanwhile you will easily solve MCQs after each lesson. Previous articleWhat Next after BDS? FCPS or ……. ?